This page lists the important technical information required for successful, reliable CD Duplication. If PMCD Mastering is carried out to correct Philips specifications then all duplicated discs should play reliably in all CD players manufactured to Philips specification. Red Book – This is the specification that all audio CDs should be manufactured to. If a disc is manufactured to red book standard then it will playback on all CD players. Any CDs that are duplicated or replicated outside of these red book standards may not play reliably on all CD players. Red book specifies a maximum CD audio duration of 74minutes and 33 seconds. Yellow Book – This is the specification that all CDROMs should be manufactured to. Blue Book – CD extra or enhanced CD are both manufactured to blue book specification. Blue book allows a mixture of red book audio and yellow book data to be added to a single CD. Orange Book – Orange book contains all the specifications for the correct manufacture of CD-R discs. If a CD-R is manufactured to correct Orange book standard then the disc can used for successful duplication of audio CDs to red book standard or for CDROM to yellow book standard. 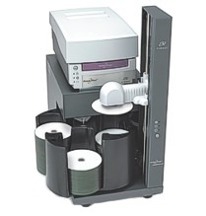 There are various manufacturers who offer CD Duplication machinery for producing up to 1000 discs automatically. These companies include MF digital, R-quest, microboards and Verity. These machines contain numerous CD recordable drives and a robotic disc picker that automatically loads and unloads the CD-R discs into the drives. These automatic duplicators can accommodate up to 16 drives and once a job is set up hundreds of duplicated discs can be produced in a few hours without the need of an operator. CD towers are also available that can be loaded and unloaded by a human operator. A master image is stored on a hard drive and then the operator loads CD-R discs in to the various drives of the towers. Some systems could actually have hundreds of these drives resulting in the possibility of creating hundreds of duplicated CDs in just a few minutes. CD replication is a far more complex process and the machinery needed to replicate CDs is far different to CD and DVD duplication machinery. For more details on the CD manufacturing replication process please visit our CD Replication UK pages.